The following is not so much a book review as some reflections from reading this book. I recommend you visit Helen over at Patient Gardener, who has written a very insightful review of this book. It is what encouraged me to purchase this book in the first place. What I wanted to do instead, was pick out a few things from the book that I found particularly useful to me, and explain why I think this book is a 'must read' for every gardener. When I first became interested in gardening, I will admit that I did take 'expert' opinions to heart. Whether it was advice from Gardeners World TV show or magazine, or from other gardeners on my allotment site, I assumed that they all knew better than me. So when I was told to space my seed sowings to the 'correct' centimetre, or that I really must use bordeaux mixture to prevent mildew on my tomatoes, I did follow the 'rules' and their advice. But when several of 'the old guys' tried to convince me that double-digging was the only way to go, thankfully I took a step back and questioned this. I admit I questioned it at first because it sounded like a lot of damn hard work, and well, ouch, my back. But then I decided to do a bit of research and found that not only was double-digging going out of fashion(! ), but that it might do more damage to the soil than other methods. The reason why I think this is a must-read for every gardener, whether you are a beginner or have been gardening for 40 years, is because it's a reminder to us all that no-one has all the answers. Questioning what you hear on TV or down at the allotment, or what you read in books and online, is the key learning point from this book. Charles urges us to have the courage to question. So when you are told, as I was, that you should thin your carrot and parsnip seedlings, well fine if you want to, but don't throw the extras away, plant them elsewhere. I've been doing this for a few years, first out of curiosity to see what would happen, and then deliberately as I found, contrary to most advice, that the carrots and parsnips grew just as well in this manner. To my great delight, Charles mentions this very point in his book, page 24. You know how you've been told that watering in sunlight damages the leaves of plants... Not true. That manure can make the soil acidic? Also not true. That potatoes clean the soil - only partly true - much of the work you have already done has cleaned the soil, not the potatoes. Perhaps the most interesting learning point for me is that it is often untrue that you need to strictly rotate your crops, particularly in a small garden. I have spent a lot of time learning about crop rotations (yes, reading and listening to 'experts'), and I was very careful with the design of my Sheffield kitchen garden to include 4-year crop rotations in the plans. Charles suggests we can be more relaxed about the 'rules' of vegetable rotations and that you should grow what you like. As he says, in small gardens vegetable families are planted quite closely together anyway, and disease could potentially meet at the edges, "although they often don't". This is something I had been thinking about when planning my beds and rotations. My kitchen garden and the beds cover a small space, c. 5m x 5m. Charles is right, the different vegetable families will be growing close together; I could throw my crop rotations onto the compost heap. However, it doesn't hurt to use crop rotations, if you are so inclined, and I am. I'm also a bit of a nerd when it comes to things like planning crop rotations and I actually enjoy putting them together (in an Excel spreadsheet, of course), like a puzzle that needs solving. It was a revelation though, to realise I didn't have to be quite so exacting. But bloody hell, I wish I questioned the myth about cleaning (to sterilise) all your pots years ago. You don't need to, see page 22*. I'm too frightened to think of how much time and water I wasted on one of the crappiest jobs in the garden. I'm not going to do it anymore. Let's move on. 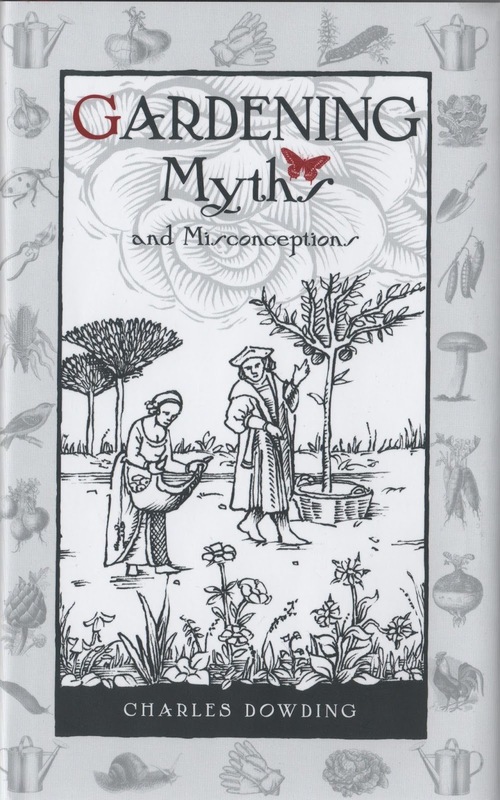 This book does talk about myths predominantly in relation to vegetable growing. However, many of the topics, sowing and planting, watering, manuring and fertilising, making and using compost, and soil structure and care, are just as relevant to ornamental growing. Perhaps one of the best things about the book is that the myths it busts will also relieve vegetable and ornamental gardeners alike, of many unnecessary and boring tasks, giving us more time to do the things we like to to, like planting and harvesting crops. My only 'niggles' about the book is the font size - why is it so small?! Yes, I was using my glasses... And although the leafy page numbers are pretty, they are also hard to read. So if the book is revised or republished in future, I hope the publishers will increase the font size and make it easier to read. It's my view that one of the great things about gardening is that there is always something new to learn, and that I'll end my life still needing to learn more. Gardening Myths and Misconceptions is a 'must read'. It might be a small book, but it has a lot of big, and sometimes challenging, ideas. It prompts you to really think about why you do things the way you do in the garden or on the allotment. It will lead to lots of questioning, probably some experimenting, and plenty of trial and error. It will also help you become a better gardener. *ok, I'll tell you - it is unlikely that any diseases young plant might get will have anything to do with the materials (pots) you use. It's more likely to come from other factors, such as damping off, or to much watering. See page 22 for full explanation. I only ever cleaned my pots once and that was enough for me! Yes, like you ,I assumed the "experts" knew best, but over the years, I have decided that maybe they don't all the time. Interesting! Have been meaning to read something by Mr Dowding for some time. Any advice that avoids boring work is fine by me. Ah, so this is why J-P has been talking about double-digging lately and how it's been discredited. Interesting, thanks! I still remember how thrilled I was to read that Charles didn't wash his pots either! I didn't because it takes too much energy, but was nice to know that I wasn't risking disease! I don't rotate strictly any more, not since moving here, one less spreadsheet... Sounds like a great book, I do find his writing good, and use his veg and salads books a lot.